Is gold a good investment? Well, let’s be clear from the outset: I don’t regard gold as a long-term investment at all. However, gold will preserve the purchasing power of your wealth through time. The performance of the economy is the key factor when assessing the attractiveness of gold verses traditional investments. Traditional investments are levered to economic growth and will outperform in a growing economy; but they will dramatically underperform inflation hedges like gold during periods of economic decline. 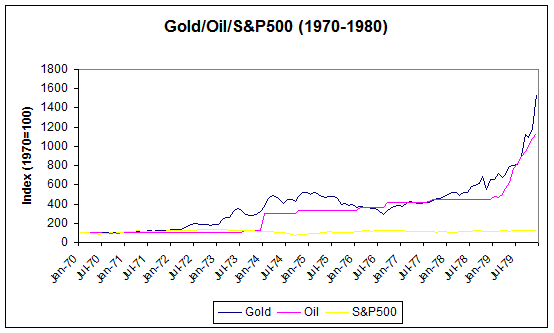 So why isn’t gold a good investment in the long-run? • It doesn’t pay any dividend or interest income, unlike more traditional investments such as stocks, fixed income securities, property or even cash in the bank. • It doesn’t provide capital growth. Your bar of gold doesn’t grow in size every year in the way that the earnings of a company may do. Being properly understood, pure inflation hedges like gold and commodities are not really investments at all. They simple preserve the purchasing power of your savings. In a declining economy they will appreciate relative to traditional investments; but in a growing economy they will SIGNIFICANTLY underperform traditional asset classes. Gold’s poor long-term performance during periods of economic growth has been amply demonstrated this century. In growth periods, assets that partake in the growth will strongly outperform a pure inflation hedge like gold. During the 1980’s, governments pulled back from their interference in the economy, which spurred growth. Traditional assets which shared in this growth, such as equities, were able to benefit in this period. But inflation hedges such as gold and commodities went nowhere for over 20 years. Putting your money into gold during periods like this would be a disaster. This isn’t to say that gold is not a good investment at certain points of time. Commodities are useful investments in times of inflation in order to preserve the purchasing power of your wealth, when traditional investments are unlikely to even preserve purchasing power. The key here is the economic climate. In a declining economy, assets tied to growth may underperform inflation hedges such as gold and commodities as they fail to keep up with inflation. During the 1970’s economic performance was lacklustre. Assets that were levered to economic performance, such as equities, failed to keep pace with inflation over the decade. 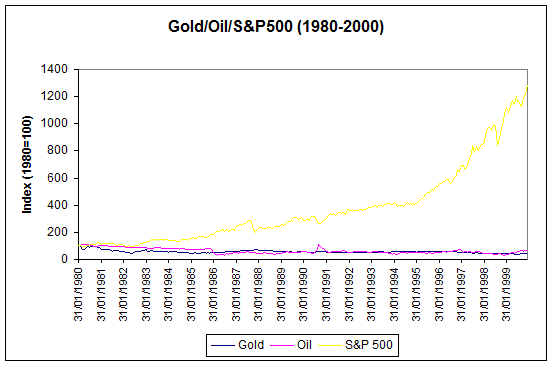 Inflation hedges like commodities and gold vastly outperformed traditional asset classes. They were not dragged down by poor economic performance, but did appreciate enough to offset inflation. In order to determine if gold is a good investment, one must have a view of the economic environment. Gold is a good investment when traditional assets are unlikely to maintain your purchasing power. That is, they are likely to depreciate when priced in gold, because they are tied to a declining economy. We are in one of these periods today and have been so for the last 12 years. When growth is strong you will do better in traditional investments. They are exposed to growth and will outperform inflation hedges in such a climate. A classic example of such an environment would be the 1980-2000 period. We are likely to enter such an environment again in the future. The key is to know when this new cycle has begun.